The Secret Army is the definitive work on the Irish Republican Army. It is an absorbing account of a movement that has had a profound effect on the shaping of the modern Irish state. The secret army in the service of the invisible Republic has had a powerful effect on Irish events over the past twenty-five years. These hidden corridors of power interest Bell and inspired him to spend more time with the IRA than many volunteers spend in it. This book is the culmination of twenty-five years of work and tens of thousands of hours of interviews. 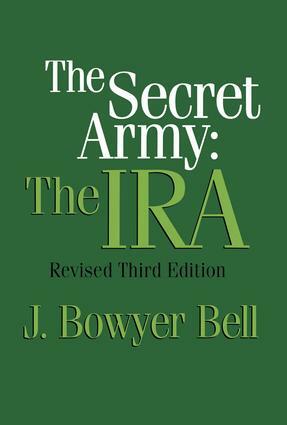 Bell's unique access to the leadership of the republican movement and his contacts with all involved—British politicians, Irish politicians, policemen, arms smugglers, and others committed or opposed to the IRA—explain why The Secret Army is the book on the subject. This edition represents a complete revision and includes vast quantities of new information. Bell's book gives us vital insight into our times as well as Irish history. This edition of The Secret Army contains six new chapters that bring the history of this clandestine organization up to date. They are: The First Decade, The Nature of the Long War, 1979-1980"; "Unconventional Conflict, The Hunger Strikes, January 1980-October 3, 1981"; The Protracted Struggle, September 1981-January 1984"; "War, Politics, and the Split, January 1984-December 1986"; The Troubles as Institution, 1987-1990": and The Armed Struggle Transformed, 1991-1996, The End Game." In his new introduction, Bell reflects on his decades of research, the experiences he has had, and the people he has met during his extensive visits to Ireland.